So here is my progress on Bordeaux Wine Sampler. 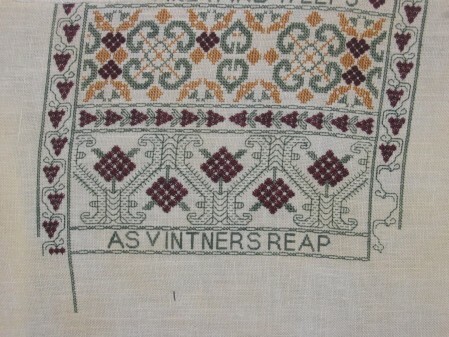 I spent a lot of time backstitching little wine stompers and rhodes stitch grape clusters. This is the last progress picture I can find which is wierd as I know I have worked on it since. Oh well. Now I am on to work on my new focus piece, LTDs German Garden. Hopefully I can have a finish on that soon too! Bordeaux is looking great. LOL at your ‘chicken’ curtains, you’ll never be able to look at them the same way now. WOW, the nursery is looking great, all it needs now is a baby!!. Great progress on the sampler. It will be beautiful when done. Looks like your baby’s room is coming along nice. He will be happy in there. This is a really beautiful design and you have made such progress. 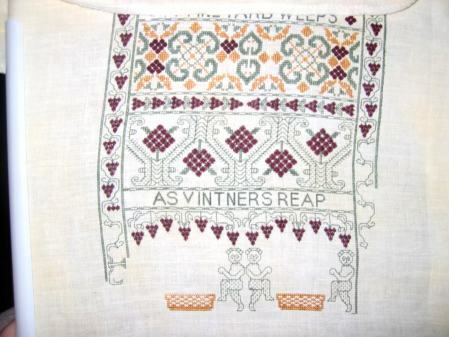 The Stompers look cute and the little grape clusters make such a nice contrast in this project. This is such a beautiful piece – I really need to stitch it. Great progress!